In a diversity of moist to dry, open to shaded habitats: swamps and borders; oak, pine, or mixed forests and clearings; rocky thickets, bluffs, and open forests; river banks; roadsides and railroads. Usually glabrous or nearly so, but variable in pubescence and leaflet shape. 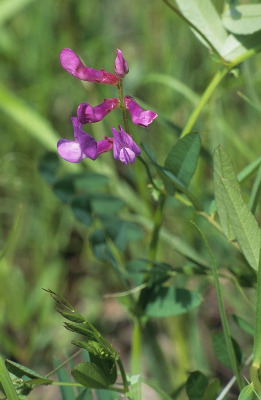 Vicia grandiflora, V. sativa, and V. sepium may also have the numerous pairs of prominent lateral veins, which characterize the leaflets of this native species. MICHIGAN FLORA ONLINE. A. A. Reznicek, E. G. Voss, & B. S. Walters. February 2011. University of Michigan. Web. April 18, 2019. https://michiganflora.net/species.aspx?id=1359.